I don’t mind cleaning, cooking, doing laundry, making a grocery list or running errands, but please don’t ask me to organize a space in my house. I’m NOT good at organizing and I don’t enjoy doing it. It actually stresses me out to look at an empty closet or cabinet and know I have to figure out how to arrange it. It’s a little easier if I’m just moving things around, but I still don’t enjoy it. 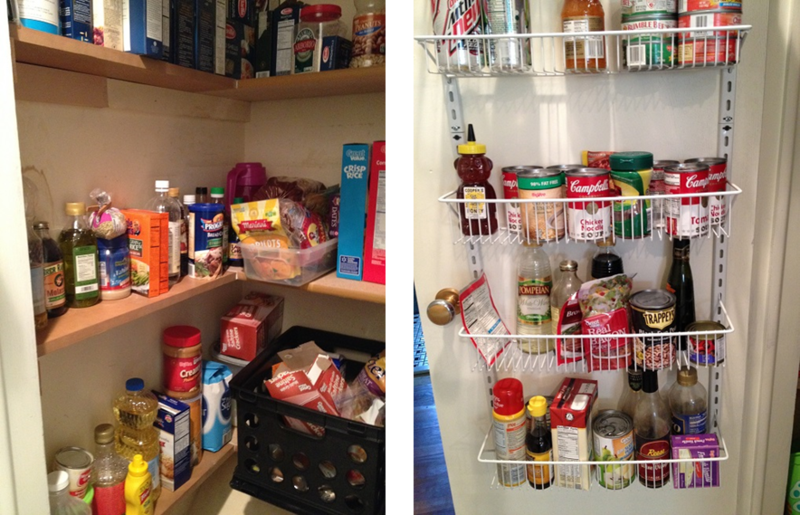 That being said, we remodeled our kitchen several months ago and the pantry needed organized. I put it off as long as I could but finally had to face the music. It was stressful and unpleasant and stressful but I got it done. Now my idea of organized may not even be close to your idea of organized but it works for me. For my purposes the pantry is organized. If you’re space organizing challenged like I am but you need to organize a space in your house, here a few things to keep in mind. 1. What are your goals for the space? Obviously my goal for my pantry was to store food and to do it in such a way that we could find what we needed fairly easily. 2. Is it easy to use? Do you have to reach up too high for things you use frequently? Do you have to squat down to get things you need? Do you have to move one thing to get to another? Those types of complications make it HARD to use and that’s no good. 3. Can you maintain the system? I tried grouping similar items when I organized my pantry but I knew I wouldn’t be able to maintain it. When I get home from the store, I don’t want to take the time to carefully arrange the food. I just want to get it put away as fast as I can. So I started out grouping but I knew I wouldn’t keep doing it. 4. Does it take too much time and effort to maintain? Maybe you are able to maintain the system, but how much time and effort does it take? Is that how you want to spend your time? If you do, that’s great. If not, maybe it’s a better idea to simplify or come up with something different. 5. Does it actually accomplish anything other than looking pretty? A pretty space is awesome as long as it’s functional. So if your organizing results in pretty AND functional, you hit the jackpot. 6. Does it make sense to others using the area? If you’re the only person using the space, you can do whatever you want. But if others are using it, too, the system needs to make sense to them and they need to be able to help maintain it. Since I’m space organizationally challenged, I keep my systems as simple as possible. If they’re too complicated or time consuming, I won’t do them. Do your organized spaces look like the ones in the magazines or are they more like mine? It would be nice if one could copy the individual bits of information about whatever subject is pointed out like your \’6 Questions to Ask Before You Organize an Area\”. This would allow me to read and reread the questions as I try to organize whatever area I am working at the time. Could this be a possibility? Thank you. I would appreciate hearing your opinion on this. Thank you. Can you explain a little more about what you mean? What do you mean by copying the individual bits of information?